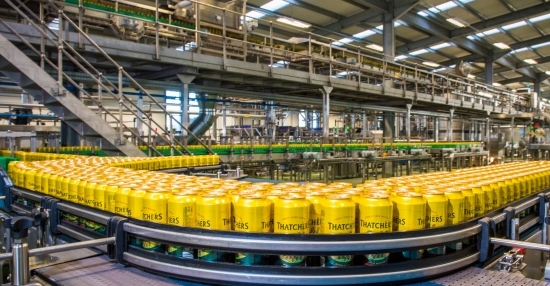 Thatchers Cider has commissioned its first canning line at Myrtle Farm, which means that the Somerset cidermaker is now able to press and package all of its ciders at its Myrtle Farm mill. The cidermaker has invested £8.3m into this state-of-the-art facility. The KHS canning line can fill 30,000 cans an hour. It features facilities that include an advanced automation, robotics, inspection and orientation system along with a bespoke packaging machine that offers Thatchers brand new pack designs as well as their traditional formats. “It has always been our intention to install a canning line and bring all our packaging, including bottling and kegging, under one roof. With the growing demand for premium cider in cans, this is an increasingly important part of our business, and so by bringing the facility in-house this is a significant development for us,” says Martin Thatcher, fourth generation cidermaker. As well as canning, Thatchers has its own state-of-the-art bottling line, which can fill, cap and label 20,000 bottles every hour along with a keg line that produces 600 pints per minute. “It’s always our aim to produce the highest quality cider from orchard through to consumer. Having our very own technical and engineering teams installing, operating and maintaining the advanced packaging equipment is a very important part of this process.